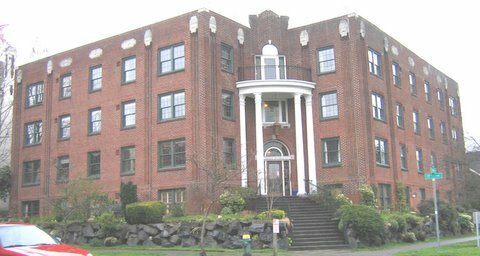 This is one of several apartment buildings constructed in 1928-29 by Samuel Anderson, a local developer and builder. They appear to have been designed either by Anderson himself or by unidentified designers on his staff. The Barbara Frietchie is the queen of the group, somewhat larger than the others and with a prominent corner location. Despite the striking two-story columns and the Colonial Revival name, much of the detailing appears to have an Zig Zag Moderne inspiration. Other buildings by Anderson in this block, often known as International Village, are the Fleur de Lis (French), Carmona (Mediterranean Revival), and Betsy Ross. They are in vivid contrast to the more typical brick-clad buildings with Tudor- or Gothic inspired terra cotta ornament. Anderson (1884-1959) was primarily a builder of single-family homes who entered the apartment field in the late 1920s. Anderson came to Seattle from Wisconsin in 1906 and became very active in the home building industry as an organizer and official of the Seattle Master Builders Association and related national organizations. In 1928-29 he developed several apartment buildings, notable for their vivid interpretations of a wide variety of styles. They are all basic three-story rectangular forms with central entrances and accommodating 14 to 16 units ranging from 660 to 900 square feet in size. The applied ornament and architectural detailing on the facades is very striking and expressive, drawing from the Art Deco, Colonial, Mediterranean Revival, French Provincial and Tudor Revival styles. Each building has its own individualized landscaping. These buildings, all built within one year, are good examples of the major construction Seattle experienced during the 1920s. The city's population had increased dramatically in previous decades, and prosperity encouraged developers to meet the pent-up demand for housing. 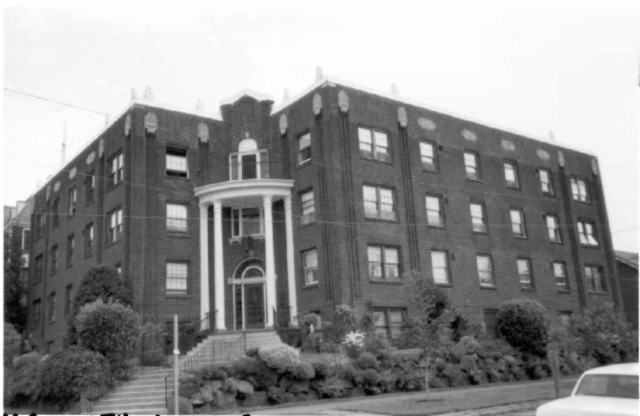 Apartments, ranging from basic housing to luxury units, were a significant factor in meeting this need, and became a major element of the streetscape in many Seattle neighborhoods. This is a fine example of the design attention paid to many of these buildings, where detailing and materials were used to reduce the impact of larger structures. This neighborhood, known as Renton Hill, had been the site of many fine homes early in the century. By the late 1920s many of those houses were becoming multifamily, and apartment buildings were being built. The area was especially attractive for its views and the convenient Madison Street car line to both downtown and Lake Washington. The Barbara Frietchie has a commanding presence on a corner, sitting above a rockery. The entry is set into the corner, with two-story white Corinthian columns and pilasters emphasizing the building's presence. At the top of the portico, on the third floor, is a Palladian window and a balcony with a balustrade. The entry has very ornate leaded glass in the for, arched fanlight and sidelights. A decorative brick plume rises out of the porch to create a fan over the entrance. The second floor window is also leaded glass. Windows elsewhere are 8-over-8, either singly or in pairs. The other ornamentation is large terra cotta acanthus leaves projecting above the cornice (above verticla brick courses) and large cast stone plaques above the top floor windows. At each corner and between the bays on the side are angled bricks giving a pilaster-like effect in the Zig Zag Moderne style.